Neptune an Outer Planet - Ice Giant with Rings has Escape Velocity of 23.71 kilometer/sec which is nearly 2.12075 times the escape velocity of the Earth. Neptune has Mass 102.43 x 1024 kilogram and Surface Gravity is 11.15 m/s2 which is roughly 1.14 times the surface gravity of the Earth. 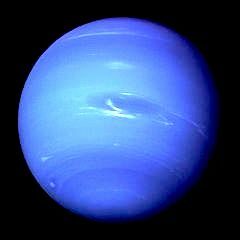 Neptune is 8th planet in our solar system.